Overall, at 2 out of 5 stars, Axe Naturals Live Probiotics is a below average probiotic. I was really let down with this product. The only thing I really like about it is that it uses a prebiotic, FOS, which is intended to help the probiotics survive in your system. It’s also free of soy, gluten, wheat and artificial preservatives. Now I’ll tell you the reasons why I don’t like this probiotic. First and foremost, I just didn’t feel anything while taking Axe Naturals Live Probiotics. Normally with a probiotic that’s this potent (50 billion cells), I can expect to see side effects but hopefully some sort of benefits. But I didn’t see any improvements or side effects. I have a sneaky suspicion that my bottle contained little to no live probiotic bacteria. This probiotic is also super expensive. It comes in at about $40 for just a one-month supply. You also have to take 2 capsules daily, which are bigger in size. After opening the bottle you have to refrigerate them to (hopefully) keep the cells alive. The capsules contain MILK, which we know is a huge allergy concern for many people. Lastly, this probiotic isn’t safe for kids, goes overboard with the amount of cells — 50 billion (even for a specific ailment) and uses soil based organisms, which may actually be harmful in some cases. So overall, at 2 out of 5 stars, Axe Naturals Live Probiotics is a below average probiotic because it’s expensive, contains milk, didn’t make me feel any better, and need to be refrigerated. 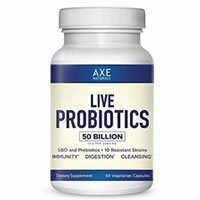 Axe Naturals Live Probiotics contains 50 billion cells in 10 different probiotic strains. This is the strain that I’m sure you are sick of me telling you about. I like it so much because it’s very well researched and is used quite extensively in many probiotic supplements. It may help with many digestive ailments such as Irritable Bowel Syndrome (IBS), gas, bloating, constipation and diarrhea. Lactobacillus acidophilus may even help with lactose intolerance symptoms, treating vaginal infections, and boosting the immune system. However, this strain may be able to help with chronic constipation and diarrhea associated with antibiotic use. We know this is a big no-no for SO many people. If you’re allergic to milk, please steer clear of this probiotic. These supplements contain NO: yeast, wheat, gluten, soy, sodium, sugar or starch. As a perk, the capsules are also free of artificial coloring, preservatives and flavoring. Other ingredients include: hypromellose, gellan gum, vegetable stearate and silica. For 60 capsules, lasting one month, it costs $39.97. Since you have to take 2 capsules daily, it works out to be a whopping $1.33 per day. I surprisingly didn’t experience any side effects. I would say this is NOT the norm, since this product is so potent. With a probiotic containing 50 billion cells, you may expect to see some bloating or belly cramps. Again, my sneaky suspicious is that my particular bottle didn’t have as many or any live bacteria. I honestly didn’t feel any different while taking these probiotics. At least I didn’t feel gross from icky side effects! Axe Naturals provides a 100% money back guarantee. You have 60 days to try the product and if you don’t like it, you can get your money back! What’s interesting is that they let you keep the bottle and everything left in it. I really like when a company stands behind their products. To buy Axe Naturals Live Probiotics, click here. Allergy Concerns Yes, it contains milk!